Skybus makes possible new forms of urban and interurban transport through smart routes that take passengers where they want, at the time they want. 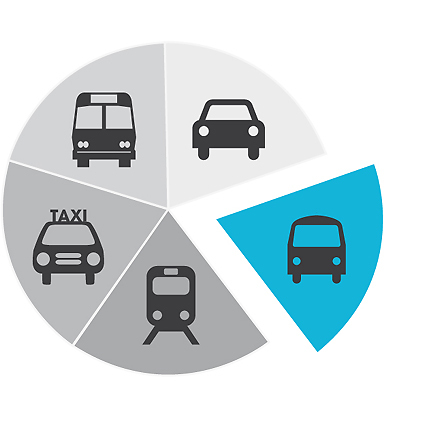 We help municipalities and authorities to improve and make public transport more flexible, increasing its coverage, serving more passengers, and optimizing service in zones and times of lower demand. We offer transport operators innovative solutions to meet new market niches and improve operations management. We allow companies of any size to offer their staff effective transportation solutions to work to improve their day to day. Skybus promotes shared mobility by making transport services faster, more direct and more efficient. It offers a sustainable alternative to the automobile to reduce emissions, pollution, traffic jams and energy consumption. Click here to learn more about Skybus solutions. New clients in Ribera del Loira already enjoy direct links between the office and the main public transport nodes. Metro, the public transport agency of Los Angeles (California), invites Skybus to participate in its first RFP to pilot microtransit. We deploy a new smart-commuting service in Pune (Maharashtra) in collaboration with Wings Travels.